I’ve been hearing from friends and former students this past while, and it is such a delight to hear that folks are continuing to sing and create. One has had a TV pilot accepted by CBS in Hollywood, another is singing in Germany, others are continuing their pursuits in Tokyo, Cleveland, and the Bay Area. I learn so much from my students, sometimes I think I should pay them! Enjoying the quiet time by exercising while memorizing the Bunnies opera. Such beautiful music and fun–I so rarely get to be funny onstage. This character is a hoot and I am having a blast learning about her as I try out her lines on my walks, It also keeps strangers from approaching me, because I am reacting to the music in my head. So, our set designer, Lisa French, has asked for help with sewing bunnies. We don’t need 334 of them but could use some help. Anyone out there handy with a needle? I’ll send you a patter and you can have a close-up on some rehearsals and our eternal thanks. I play the rather, um, eccentric woman with the bunnies; Donald Wilkinson is Officer O’Hare (get it?) 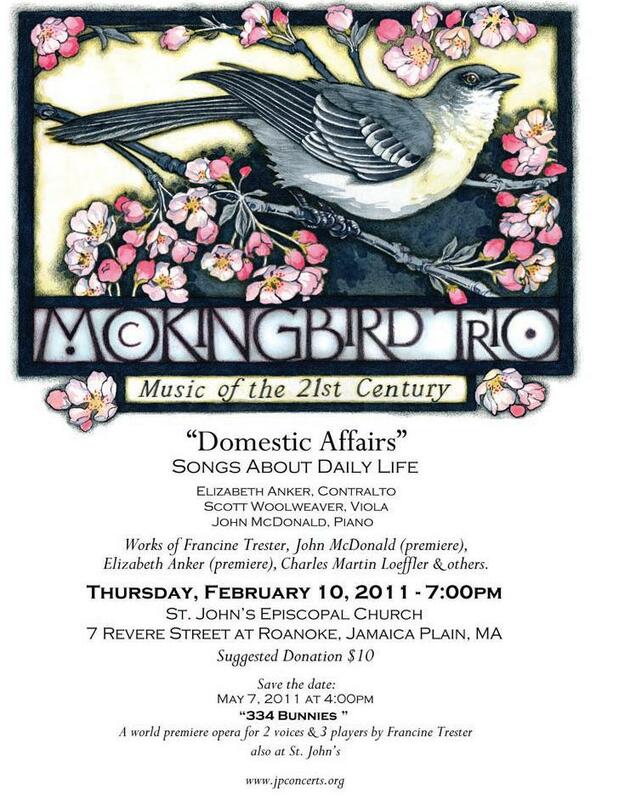 and our orchestra is the Mockingbird Trio with Fran Trester on violin, Scott Woolweaver on viola and John McDonald at the piano. Today I led 260 Senior Citizens singing “My Girl“in harmony at the Elder Expo in Boston. Can’t get better than that, or can it? Upcoming: Classes start soon at Longy, NEC and the United South End Settlements (where the hip Seniors find me on Wednesday afternoons). Upcoming: A new piece by John McDonald on Elizabeth Bennet’s shakuhachi recital at Tufts onOctober 16 (3 PM at Tufts)…come to this free concert and find out what a shakuhachi sounds like. 334 Bunnies in January, February and May (Longy School, JP Concerts and Shirley Meeting House, in that order). More to come! Corner of Roanoke and Revere, near Green St. station. I am so delighted to revisit the song cycle, Songs of Time, of Love, of Wonder, for this concert. Douglas Johnson, a long-time friend and colleague from California, wrote this 5-song cycle in 1995 for me, on texts chosen by Aina and me–May Sarton, Emily Dickinson and a Latvian folk poet. We have recorded these songs professionally (see recordings page if you’re interested). Now, Douglas is reworking the songs to include a bit of viola in some of the songs, which make it even more satisfying to include on a Mockingbird Trio program. And we are revisiting Eric Sawyer’s Levertov Songs, along with songs of other composers from our original Poet Power concert. Because May 7 is Brahms’ birthday (don’t you all celebrate your favorite composers’ birthdays? ), we’ll include some of his works as well. And John McDonald will likely play some of his fabulous solo piano pieces. Come join us for a lovely hour of chamber music and still have enough daylight to take a walk in the Arboretum! One of our songs is “1,000 Grandmothers” written by Holly Near. The Platinum Singers rehearse weekly at the Harriet Tubman House of the United South End Settlements (www.USES.org). Come hear us or join us next Fall. By the way, the fellow who made the video about our singing group (which is actually a voice class), Scott LaPierre, recently won a journalism award for his great work. Go Scott! One lovely hour of chamber music–songs about birds and nature by Francine Trester, John McDonald, and 2 new songs by me! We’re doing a series at this lovely church. St. John’s Episcopal, 7 Revere Street at Roanoke in Jamaica Plain. Come back in February for Domestic Affairs and in May for the world premiere of “334 Bunnies” by Fran Trester with Phil Lima, baritone and yours truly. The most recent recording is out and it is gorgeous, if I do say so myself. Some of the pieces were “in the can” for nearly 10 years and it’s a joy to hear them. We (Magnificat Baroque, 8 virtuoso women singers plus theorbo and organ) recorded the rest of the works of this amazing composer and that CD should be out by Christmas.